At the front of the engine there is a seal that designed to control oil from leaking out. This seal is located at the front of the crankshaft as it protrudes out of the front of the engine block. The front part of the crankshaft is where the balancer or dampener (same thing) is bolted too and is where the serpentine belt is driven from. Typically the front main seal is pressed into the front timing cover or into the seal housing on timing belt motors. This seal is constructed with a metal outer ring a rubber lip seal using a small circular spring which holds tension on the lip seal as it rides against the sealing surface of the harmonic balancer hub. A harmonic balancer or dampener is a weighted circular part unit used to help an engine run smoothly and keep in balance. 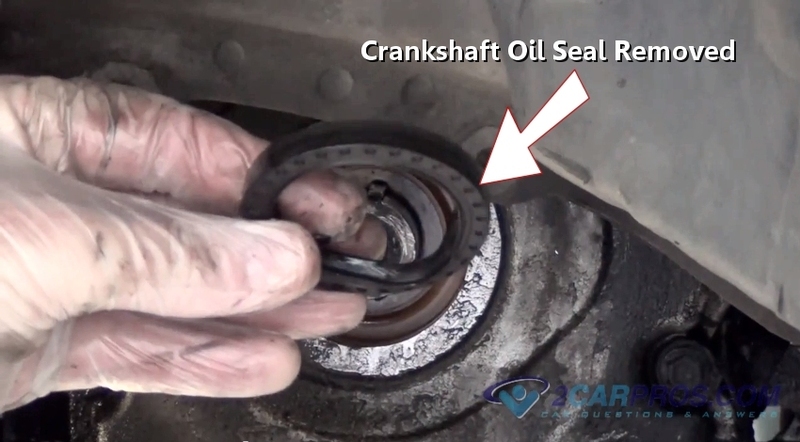 As in with any engine seal heat and engine vibration can cause the seal to become hard and loose its sealing ability which will allow residual engine crankcase pressure to force oil past the seal and out from the engine. 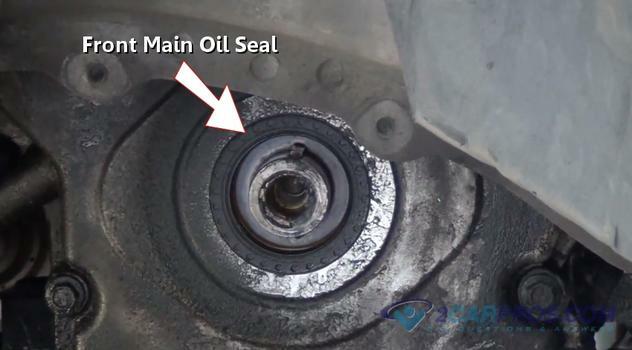 Because the seal rides against the inner hub of the balancer it can cause grooves to be created in the hub which case the lip seal cannot hold oil inside of the engine. The cost of the front main seal is mostly labor. If you were doing the job yourself the cost of the seal would be between $12.00 and $52.00 from Amazon. If you are having the job done at a repair shop except to pay between $250.00 and $550.00 depending on manufacturer and if the car is front wheel or rear wheel drive. A video of our mechanic performing this job is at the bottom of this guide. The car will need to be jacked up in most cases and supported on jack stands. Wear protective eyewear and gloves with the engine cool. Anytime you are working on the engine front there is the potential of creating short circuit if you touch a wrench or any metal piece from battery power to ground. 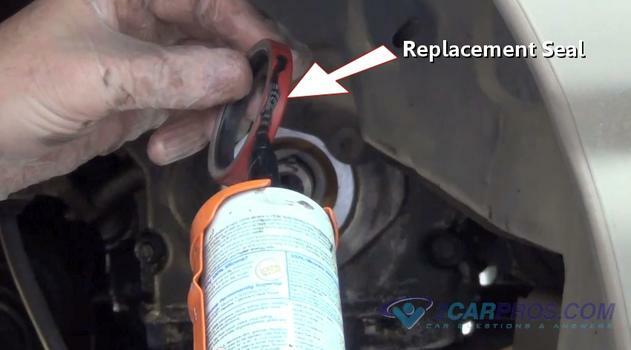 To prevent this remove the negative cable of the battery to stop the electrical power to the car. 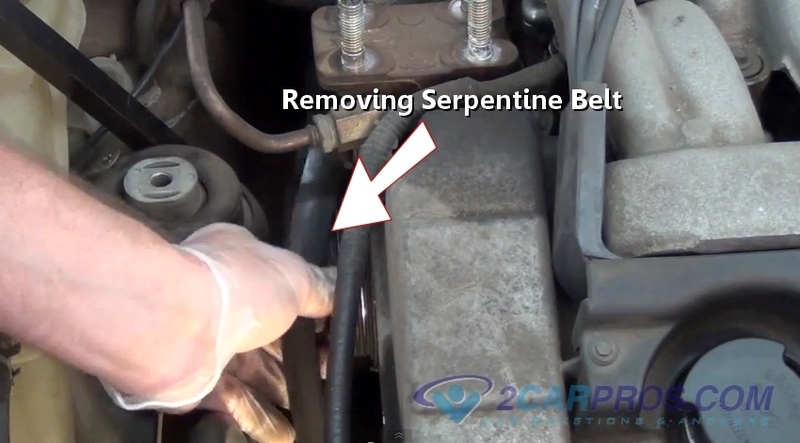 The serpentine belt is used to drive the accessories of the engine such as the alternator and water pump. This belt must be removed to gain access to the dampener which must be removed to replace the front main seal. For this step most engines are a little bit different you must disassemble the engine to where you can access the front dampener bolt. 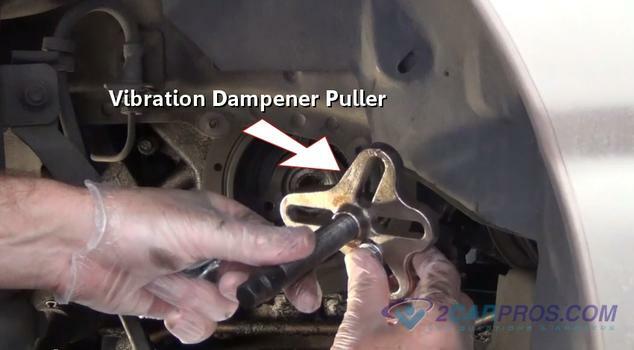 This means removing the fan clutch on most rear wheel drive cars and it can also mean removing the radiator. Most front wheel drive cars can follow this guide with minor variations. If you are using an air impact gun this step is a lot easier but if not do worry you will just need to remove the starter so you are able to gain access to the engine flywheel. This is so you can hold the engine from turning by wedging a large standard screwdriver between the teeth of the flywheel and the engine block or transmission case. 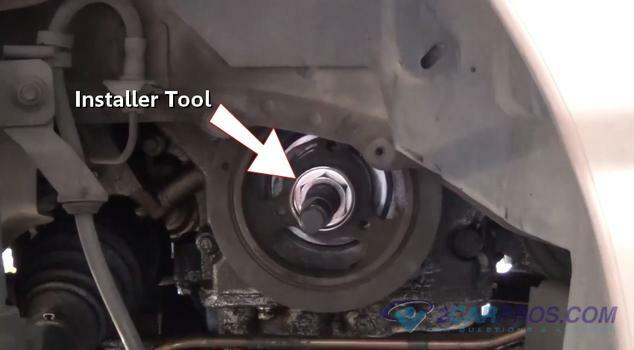 If you have an open access to the bottom of the flywheel which some older cars do they make a flywheel holder tool which you can get from Amazon. Do not try to stop the engine from turning over any other way or you can damage the engine. 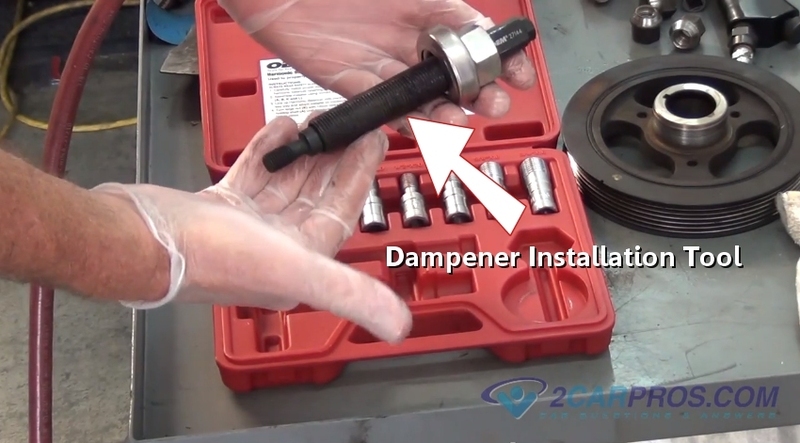 Use a large socket 22mm to 24mm to remove the dampener bolt by turning it counterclockwise. No engine that we know of has a reverse thread dampener bolt. This bolt is tight (about 140 foot pounds) so make sure you have a good grip of the ratchet and make sure the socket is squarely on the bolt to avoid rounding of the bolt head. In the image below we are using an air impact gun to remove the bolt. To remove the balancer you will need a three prong puller which you can also get from Amazon for between $16.00 and $30.00 (US). 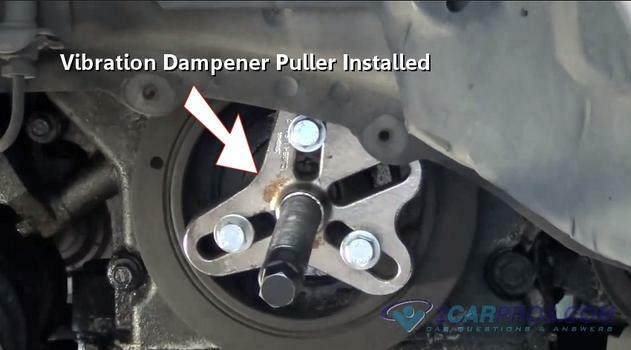 Use can also rent a puller for free from the local auto parts store. These pullers are basically a metal plate with three slots and a large screw in the center with a pivot that rotates within the screw. This screw will endure a good amount of pressure when removing the dampener so it should have a small amount of grease it help lubricate the threads of the puller. 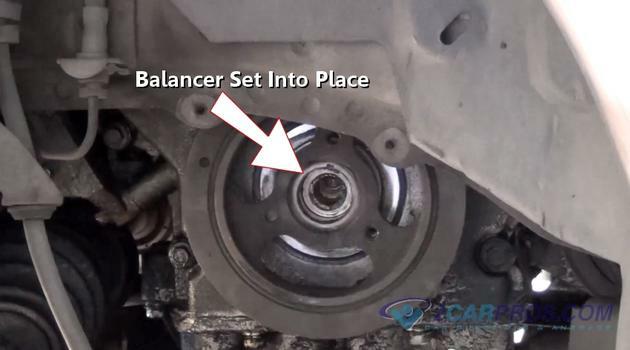 Most balancers will have three threaded holes in the main body of the balancer in which three bolts and washers can be installed that you may need to get from the local hardware store if the puller kit is missing them. With the puller screw unwound insert the bolts into the dampener evenly. Make sure there is a good amount of threads the bolts are holding on with inside of the dampener. In other words you don't want the bolts to have one or two threads holding the puller because they will pull out once the puller screw is engaged. Try to get the puller as square as possible to the balancer. Start to tighten the puller center screw using the air impact or socket wrench. This will apply pressure to the puller. If is socket is being used the flywheel will need to be held as mentioned earlier. The screw of the puller will become very tight and then there will be a pop signaling the balancer is starting to move off of the crankshaft. At this point the screw will become easier to turn as the balancer moves further away from the engine. Continue this action until the balancer has completely become loose from the engine. At this point you can remove the puller from the balancer and return to the parts store or stow it away until next time it is needed. The front main seal will now be exposed at the front of the crankshaft. 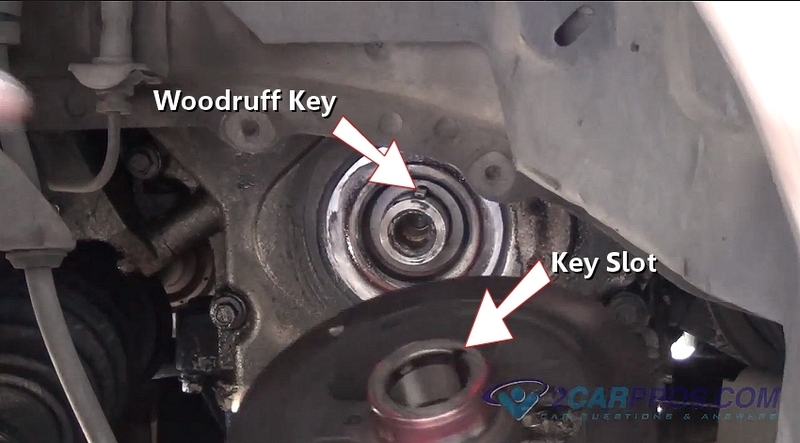 Inspect the woodruff key which aligns the damper to the crankshaft. Sometimes this key can come off during the process and if so should be located. The clean part of the timing cover is wear the engine oil leak has washed part of the cover off indicating a oil leak. 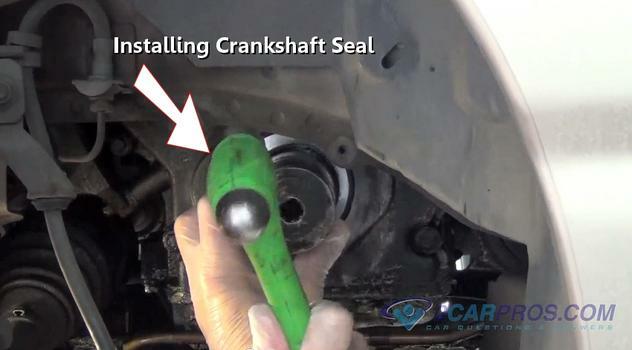 Using a large standard screwdriver or seal puller and pop the seal loose from the timing chain cover or seal housing. Work the seal loose by gently prying round the seal being careful not to score the metal of the seal housing or timing cover. 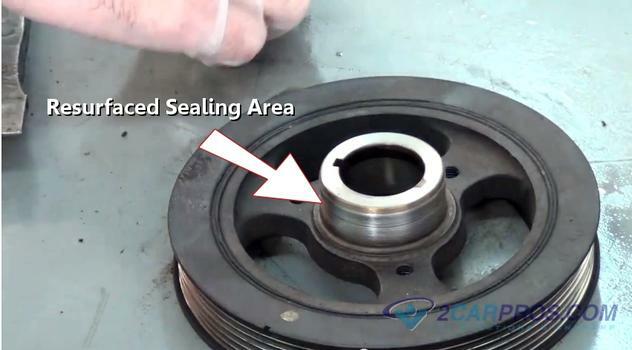 Any major grooves cut into these parts can cause a leak once the new seal is installed. 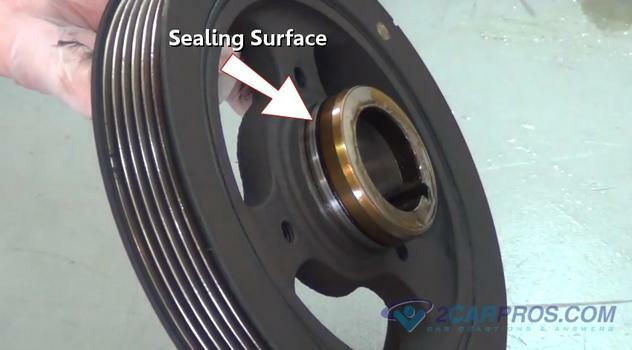 Once the seal has been removed inspect it for obvious failures such as dried, torn or dilapidated lip seals or a broken seal spring. 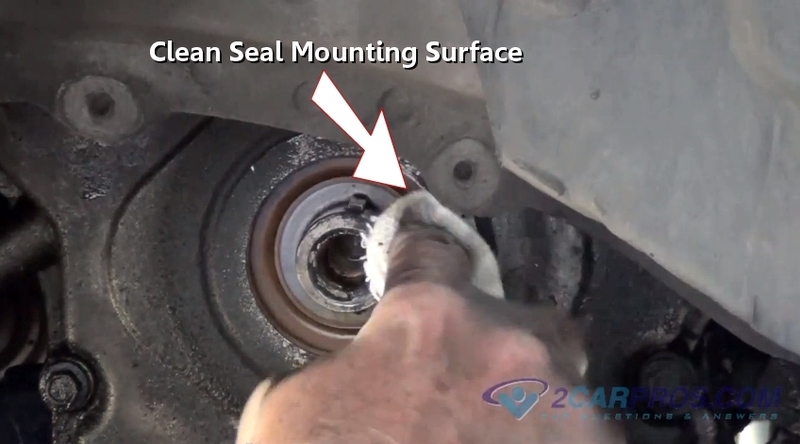 Use a shop towel and clean the mounting surface of the seal. A small amount of carburetor cleaner works good for this though you don't want to spray cleaner down into the engine. 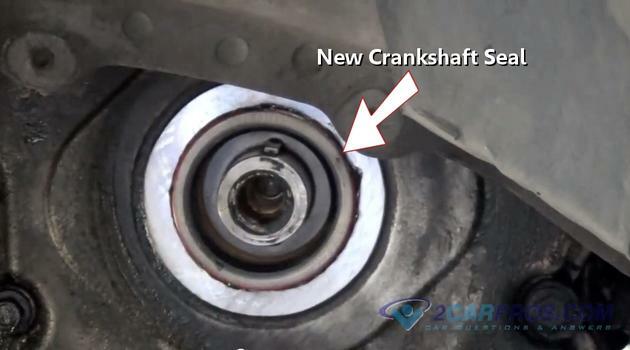 Also clean the front of the crankshaft as well. Match the old seal to the new unit to make sure the inner and outer diameters are the same. Then apply a small amount of silicone sealer to the outer rim of the seal. 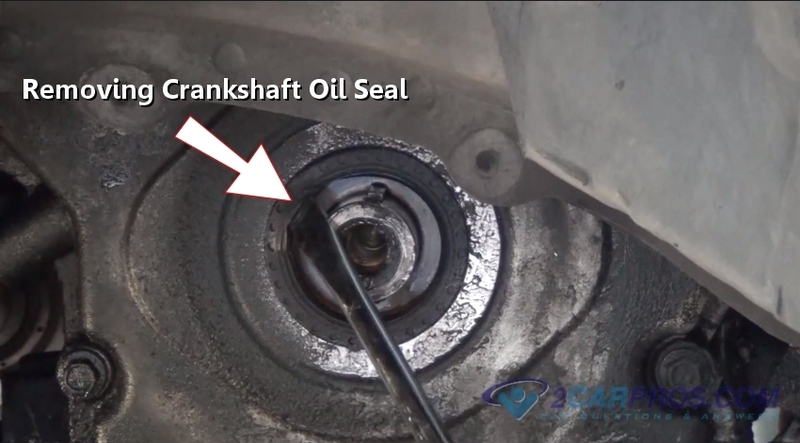 This will help protect against any oil leaks from around the outside of the seal body. Be careful at this point because if you install the seal backward it will leak. The lip of the seal must be pointing inward toward the engine. Gently set the seal in place into the timing cover or seal housing. Now it is ready for installation. Use a hammer and large socket or seal installer which you can get from Amazon for about $90.00 or rent one for free from the local auto parts store. Gently tap the seal into place making sure the seal stays square throughout the installation process. The seal will sit flush or almost flush once it is fully installed. Inspect the balancer's sealing hub for damage and grooves where the old seal rode against. In the image below you can see burnt oil residue which is present in all engines. If this balancer is installed in its current state the new seal will leak. Use a small piece of emery cloth or sandpaper and prepare a new clean surface for the new front main seal to ride against. If these grooves are too deep or a fresh surface cannot be made smooth the dampener must be replaced. In the image below you can see what it should look like once you are finished preparing the balancer seal hub. 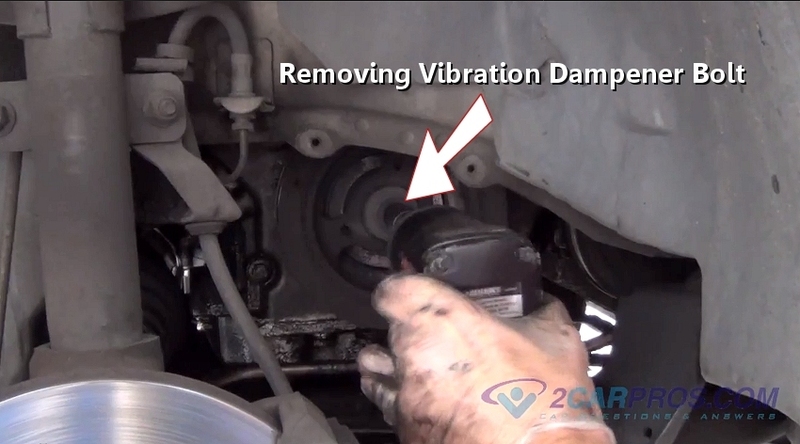 Clean the hub using a shop towel and make sure there is no sanding grit left behind. 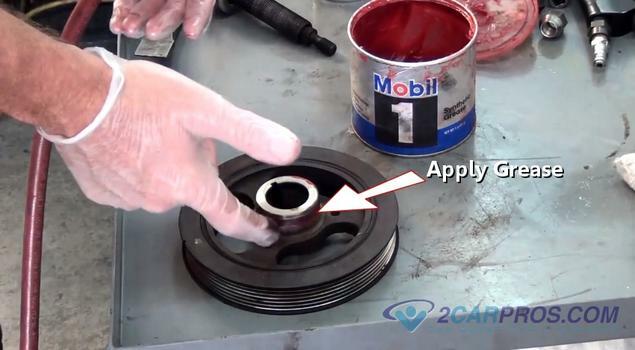 Apply a small amount of grease to the balancer hub sealing surface. This will lubricate the seal once the engine is started up. If you do not add grease at this point when the engine is started the balancer will rotate burning the seal and jeopardizing its ability to work correctly. To reinstall the balancer a tool is required which can be obtained for free at the local auto parts store or Amazon for about $33.00 (US). This tool uses a bearing and a threaded screw which is inserted into the end of the crankshaft. The bearing rides against the balancer while it is being pressed back onto the end of the crankshaft. 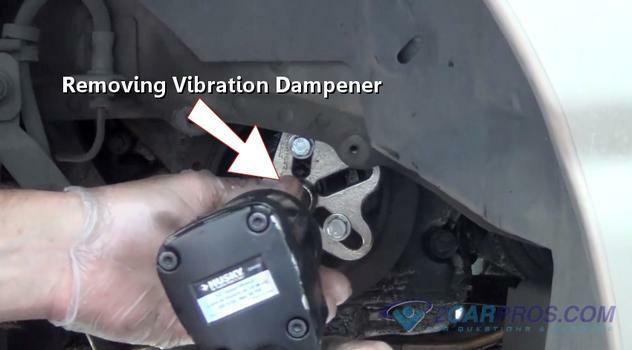 Never use a hammer to install the balancer or it will destroy the crankshaft thrust bearings inside the engine. It is also a good idea to place the dampener inside an oven and heat it up to 175 degrees which will expand the metal and make the installation easier. Choose the right thread from the tool and make sure it treads easily into the end of the crankshaft. Grasp the balancer firmly and take note of the woodruff key location and match it to the dampener location. This is important that these two parts line up or the dampener will not be able to be reinstalled. Now the balancer is ready to be pushed onto the end of the crankshaft which can be slightly by hand. At this point the tool should be at your side and ready to be screwed into the end of the crankshaft to further hold the balancer in place. Screw the balancer installation tool into the end of the crankshaft making sure the bearing nut is backed off and that the screw of the installation tool is fully engaged into the end of the crankshaft. If the installation tool screw is not fully in it will pull out of the crankshaft damaging the threads causing a problem. Use wrenches hold the center of the tool (screw) steady while turning the bearing nut clockwise to tighten the bearing against the balancer. 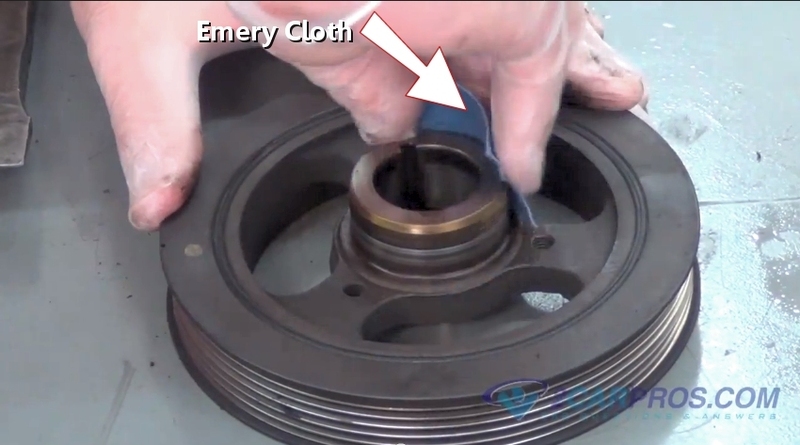 At this point the flywheel will not need to be held because the outer wrench will hold the engine from turning. Continue this operation until the balancer is fully installed. You will be able to tell this because the bearing nut will not be able to be turned any further. Once completed unscrew installation tool to remove. This is a little known trick that we will pass on to you. 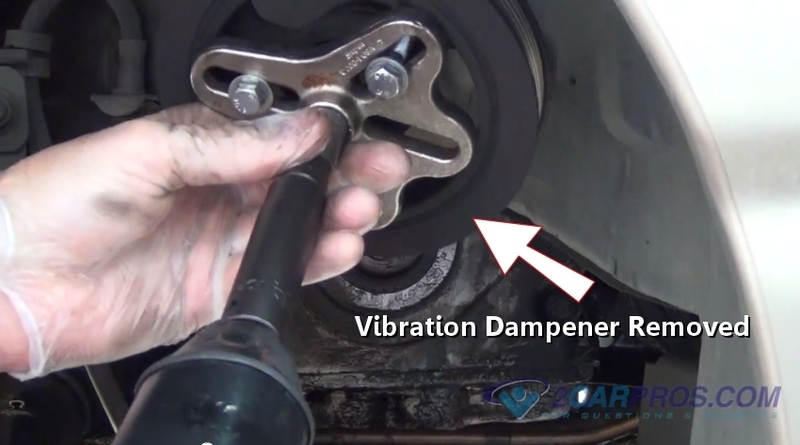 Apply a small amount of silicone rubber to the balancer bolt. 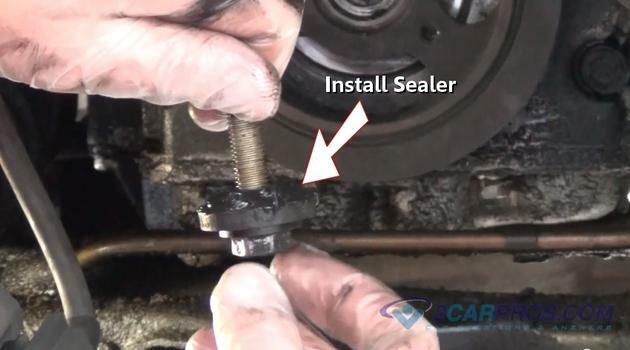 This will help seal the bolt from oil leakage due to a slight seepage that can occur between the crankshaft snout and the balancer hub. Once applied, thread the bolt into the end of the crankshaft by hand to avoid cross threading. 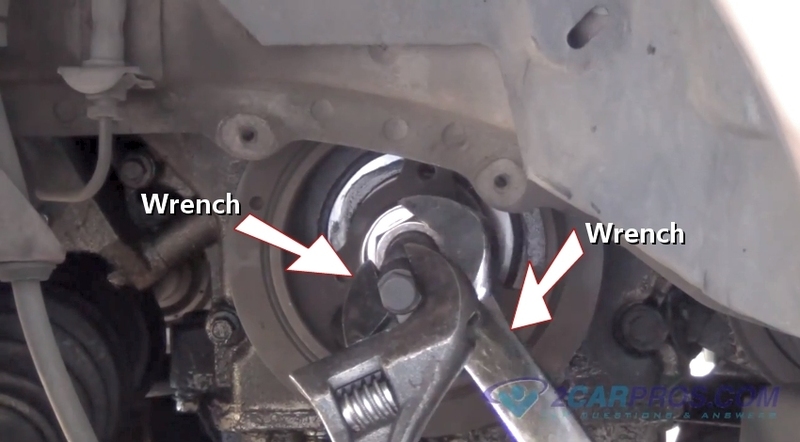 Use an air impact or regular socket wrench to tighten the bolt. If a regular socket is used you will need to again hold the flywheel from turning. The torque specification for this bolt will vary but in most cases it is between 120 and 140 foot pounds. Reassemble the serpentine belt and any other accessories needed to complete the job and you are all set. It is a good idea to change the oil and filter once a job like this is performed due to little particulates that can enter the engine. When starting the engine listen for abnormal noises which are a sign that something is not quite right. Shut the engine off and recheck the job. If you have any front main seal questions please visit our forum. If you need car repair advice, please ask our community of mechanics is happy to help you and it is always 100% free.